This is the working documentation for the Copper project. The OPNFV Copper project aims to help ensure that virtualized infrastructure and application deployments comply with goals of the NFV service provider or the VNF designer/user. This is the third (“Danube”) release of the Copper project. The documentation provided here focuses on the overall goals of the Copper project and the specific features supported in the Colorado release. As focused on by Copper, configuration policy helps ensure that the NFV service environment meets the requirements of the variety of stakeholders which will provide or use NFV platforms. According to their role, service providers may apply more specific configuration requirements than users, since service providers are more likely to be managing specific types of infrastructure capabilities. Developers and users may also express their requirements more specifically, based upon the type of application or how the user intends to use it. For users, a high-level intent can be also translated into a more or less specific configuration capability by the service provider, taking into consideration aspects such as the type of application or its constraints. Although such intent-to-capability translation is conceptually useful, it is unclear how it can address the variety of aspects that may affect the choice of an applicable configuration capability. For that reason, the Copper project will initially focus on more specific configuration requirements as fulfilled by specific configuration capabilities, as well as how those requirements and capabilities are expressed in VNF and service design and packaging or as generic policies for the NFV Infrastructure. Add the OpenStack Congress service to OPNFV, through at least one installer project, through post-install configuration. HA deployment: Congress should be installed in OPNFV deployments in a non-HA mode, including in HA deployment scenarios. Basic HA support has been implemented for Congress (see http://docs.openstack.org/developer/congress/index.html), but this feature has not yet been verified on the OPNFV platform. Horizon plugin: The Congress OpenStack Dashboard plugin (a “Policy tab”) has not been deployed in OPNFV as of this release. Installing the needed Congress Dashboard plugin files on the OpenStack Dashboard host is a future work item. State Information that can be used to convey or imply the state of something, e.g. an application, resource, entity, etc. This can include data held inside OPNFV components, “events” that have occurred (e.g. “policy violation”), etc. Event An item of significance to the policy engine, for which the engine has become aware through some method of discovery e.g. polling or notification. As a service provider, I need to prevent tenants from bridging networks I have created with different security levels, e.g. a DMZ network and an Admin network. As a service provider, I need to ensure that applications which have not been designed for exposure in a DMZ zone are not attached to DMZ networks. Reactively enforces the dmz placement rule by pausing VMs found to be in violation of the policy. As a service provider or tenant, I need to periodically verify that resource configuration requirements have not been violated, as a backup means to proactive or reactive policy enforcement. As an NFV Infrastructure provider, I need to ensure that my admins do not inadvertently enable VMs to connect to reserved subnets. Ensures that the VM instance is launched “with affinity to” specific resources, e.g. within a compute or storage cluster. Examples include: “Same Host Filter”, i.e. place on the same compute node as a given set of instances, e.g. as defined in a scheduler hint list. Ensures that the VM instance is launched “with anti-affinity to” specific resources, e.g. outside a compute or storage cluster, or geographic location. Examples include: “Different Host Filter”, i.e. ensures that the VM instance is launched on a different compute node from a given set of instances, as defined in a scheduler hint list. Networks connected to VMs must be public or owned by someone in the VM owner’s group. Link Mirroring: As a troubleshooter, I need to mirror traffic from physical or virtual network ports so that I can investigate trouble reports. Link Mirroring: As a NFVaaS tenant, I need to be able to mirror traffic on my virtual network ports so that I can investigate trouble reports. Unauthorized Link Mirroring Prevention: As a NFVaaS tenant, I need to be able to prevent other tenants from mirroring traffic on my virtual network ports so that I can protect the privacy of my service users. Link Mirroring Delegation: As a NFVaaS tenant, I need to be able to allow my NFVaaS SP customer support to mirror traffic on my virtual network ports so that they can assist in investigating trouble reports. Storage resources connected to VMs must be owned by someone in the VM owner’s group. As a tenant or service provider, I need to be automatically terminate an instance that has run for a pre-agreed maximum duration. The following example diagram illustrates a “relationship diagram” type view of an NFVI platform, in which the roles of components focused on policy management, services, and infrastructure are shown. This view illustrates that a large-scale deployment of NFVI may leverage multiple components of the same “type” (e.g. SDN Controller), which fulfill specific purposes for which they are optimized. 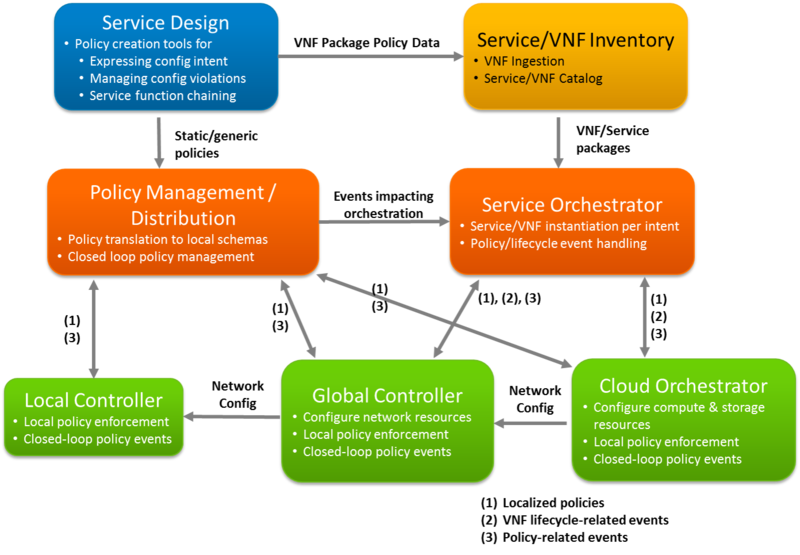 For example, a global SDN controller and cloud orchestrator can act as directed by a service orchestrator in the provisioning of VNFs per intent, while various components at a local and global level handle policy-related events directly and/or feed them back through a closed-loop policy design that responds as needed, directly or through the service orchestrator. Some events/analytics need to be collected into a more “open-loop” system which can enable other actions, e.g. Additional projects that are commonly used for configuration management, implemented as client-server frameworks using model-based, declarative, or scripted configuration management data. Polled monitoring: Exposure of state via request-response APIs. Notifications: Exposure of state via pub-sub APIs. Realtime/near-realtime notifications: Notifications that occur in actual or near realtime. Delegated policy: CRUD operations on policies that are distributed to specific components for local handling, including one/more of monitoring, violation reporting, and enforcement. Violation reporting: Reporting of conditions that represent a policy violation. Reactive enforcement: Enforcement actions taken in response to policy violation events. Proactive enforcement: Enforcement actions taken in advance of policy violation events, e.g. blocking actions that could result in a policy violation. Compliance auditing: Periodic auditing of state against policies. OpenStack Congress provides a table-based mechanism for state monitoring and proactive/reactive policy enforcement, including data obtained from internal databases of OpenStack core and optional services. The Congress design approach is also extensible to other VIMs (e.g. SDNCs) through development of data source drivers for the new monitored state information. OpenStack Aodh provides means to trigger alarms upon a wide variety of conditions derived from its monitored OpenStack analytics. Nagios “offers complete monitoring and alerting for servers, switches, applications, and services”. Depending upon the priority of discovered gaps, new requirements will be submitted to upstream projects for the next available release cycle. This release includes installer support for the OpenStack Congress service under JOID and Apex installers. Congress is installed by default for all JOID and Apex scenarios. Support for other OPNFV installer deployed environments is planned for the next release. There is no specific hardware configuration required for the Copper project. For JOID, Congress is installed through a JuJu Charm, and for Apex through a Puppet Module. Both the Charm and Module are being upstreamed to OpenStack for future maintenance. Other project installer support (e.g. Doctor) may install additional datasource drivers once Congress is installed. NOTE: This section describes a manual install procedure that had been tested under the JOID and Apex base installs prior to the integration of native installer support through JuJu (JOID) and Puppet (Apex). This procedure is being maintained as a basis for additional installer support in future releases. However, since Congress is pre-installed for JOID and Apex, this procedure is not necessary and not recommended for use if Congress is already installed. For Apex installs, on the jumphost, ssh to the undercloud VM and “su stack”. To invoke the procedure, enter the following shell commands, optionally specifying the branch identifier to use for OpenStack. No configuration procedures are required beyond the basic install procedure. This section describes optional procedures for verifying that the Congress service is operational as well as additional test tools developed for the Colorado release. These scripts, related scripts that clean up the OpenStack environment afterward, and a combined test runner (run.sh) are in the Copper repo under the “tests” folder. Instructions for using the tests are provided as script comments. Further description of the tests is provided on the Copper wiki at https://wiki.opnfv.org/display/copper/testing. Browse to the webapp IP address provided at the end of the install procedure. Interactive options are meant to be self-explanatory given a basic familiarity with the Congress service and data model. This release focuses on use of the OpenStack Congress service for managing configuration policy. See the Congress intro guide for general information on the capabilities and usage of Congress. Examples of Congress API usage can be found in the Copper tests as described on the OPNFV wiki at https://wiki.opnfv.org/display/copper/testing. © Copyright 2017, OPNFV. Licensed under CC BY 4.0.. Last updated on Feb 02, 2017.